Phew. Do you ever have those wonderful, fabulous weekends that are tons of fun, yet leave you needing another weekend to recover? Well, this weekend was one of those weekends. My weekend somehow started on Wednesday. B and I hit the road after work for the long drive to Schroon Lake, where we’d be celebrating the marriage of Mitch, a close college friend, and Becca, who we somehow had not yet met. The 9ish hour drive ended at around 2 a.m., when we woke up Mitch and Becca and decided to hang out and talk about their upcoming wedding and some fun old memories until the wee hours. Thursday morning I had to work, so I plugged in my laptop and sat outside while the boys (B and Mitch) swam in the lake and went for a boat ride. I couldn’t really complain about missing out – Mitch’s mom had made us an amazing breakfast (eggs over easy, toast, fruit and bacon) and I was able to sit outside and get my work done while enjoying some amazing views. Thursday night, we checked into the B&B where we were staying and then headed to the pre-wedding dinner and met most of Becca’s family and friends. We stayed out at the local bar for a little while before heading back to the B&B and cabins where everyone was staying to hang out until the wee hours of the night (notice a pattern?). Friday morning was the wedding day! 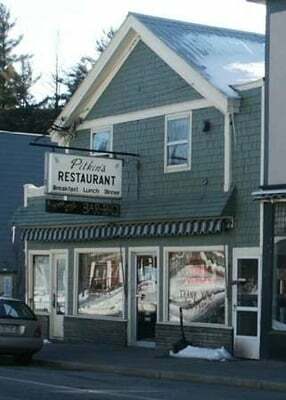 Mitch, his friends, B and I hit up downtown Schroon Lake and Pitkin’s, a favorite local diner, for breakfast (me: Western omelet with hash browns; B: 2 pancakes, 2 slices of bacon, 2 sausages). The plan had been to go for a hike or golf during the day with Mitch before the wedding, but right when we decided we’d meet up, it started to downpour. And not just a little, misty rain – but the skies opened up and Schroon Lake experienced more rain than it had all summer. Two hours before the outdoor wedding was to begin. The rain didn’t stop. The wedding was moved from the gazebo in downtown Schroon Lake to underneath the porch at Mitch’s Lake House – which ended up being perfect and gorgeous! And of course, as soon as they were married, the rain stopped and we were able to enjoy the evening, dancing outside, by the lake, under the stars. After the wedding, we again went back to the cabins to party and I even learned a little ukulele! Bride and Groom – no more rain! Stalking the family photo – check out the gorgeous backdrop! Saturday morning, Mitch’s friends again ended up at Pitkin’s for brunch before the full day of celebration (aka Lakefest) was due to begin at 11 a.m. Since the day’s festivities were starting with a BBQ, I convinced B we didn’t need to hit up the diner again, but instead could go for a run. Score! It was hot and humid, and we only ran around the town, but it felt good to get my legs moving before another day of festivities. After arriving back at the lake house, B and I enjoyed a pontoon ride, tubing, a speed boat ride, and some swimming before it started pouring again. The rest of the guests were supposed to arrive around dinnertime, and again, like clockwork, as soon as everyone had arrived, the rain stopped. This time, a gorgeous rainbow appeared. We enjoyed dinner, more dancing, corn hole (somehow B and I were the reigning champs? ), beer pong, and more made up games back at the cabins until late. Sunday morning, B and I woke up early and met up with everyone at Pitkin’s once again. Same order for most of us (yes, another Western omelet), but there was a bittersweet feeling as most of us had to get on the road for our trips back to our prospective home towns. Nobody was traveling quite as far (most of his friends had stayed close to home, in the Connecticut, NYC area), but we all knew the 4 days of Mitch and Becca’s wedding weekend had come to a close. B and I hit the road after another amazing greasy brunch and were able to even stop by my parents’ house on the way back, who had just returned from their travels abroad to visit my brother in Turkey and Scotland. We didn’t make it back to Cleveland until late, but it was worth it. Cheers Mitch and Becca – thanks for including us in your special day and we hope to see you soon!